I've been enjoying the Olympics - both of them. It's been fun seeing the various projects for the Knitting Olympics in process and their completion. In the meantime, my own progress has been a little lackluster. Lately it seems that I have been frogging just as much I've been knitting. I'm re-knitting my sleeves for the cardigan, hopefully with success this time, and making them set-in instead of raglan. If I don't finish soon it'll be too warm to wear the sweater. Actually it's been pretty warm here in SC most of the winter so I can't use that as an excuse not to finish. The Pharaoh's Check socks are waiting for a turn in the frog pile. I kept knitting the sock even though I was never pleased with the way it looked. In the process I tried a new sock technique, the round toe, and hated it. 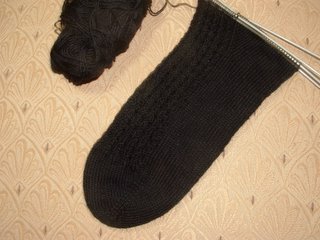 I've switched to knitting the Baby Cable socks from Sensational Knitted Socks in basic black and even though my brother was expecting Gamecock Red and Black, I think he'll be pleased with these. Normally I don't knit with eyelash type yarns (not that I'm snobbish), but last Thursday evening I whipped out this cute little bag. It's the Fiber Trends "Night on the Town" accessories pattern. This pattern works up so quick and fast. It almost took me longer to felt it than to knit it. I used an offbrand worsted, Filatura Lanarota, that I bought online and Funny Medium Glitter purchased from Bea Ellis Knitwear when she had the sale on Funny yarns. Tonight I'm working on a class on "Textured Knitting" for my knitting guild, the Palmetto Purlers. I thought I had my class mapped out, but this topic has turned out too be more than a little confusing. Every resource I've read has a different interpretation of what is considered textured knitting. I think I'll knit a swatch from each group and cover the basics. Smoking Update - 4+ weeks!!! Those are vey nice socks. I really should make my hubby a pair since I rarely make him anything. My friend Beth is knitting more sock models for Charlene Schurch's next book. 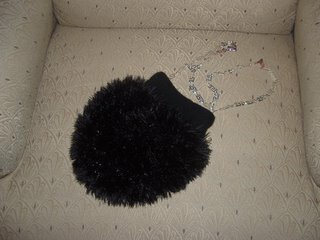 I like the purse too even though I'm not into fun fur. It works for that purse though. I really like the shape of that purse. Congrats on the non-smoking anniversary. You can do it! Speaking of the Purlers, Donald is trying to get his mom and one of her lady friends from church to come to a meeting. I think she could use some encouragement from more advanced knitters.